I am so depressed, disgusted, and humiliated by the actions, words and deeds, of my children. I feel sick to the very core of my being. Father God, I need Your touch. I cannot even express my thoughts properly, but You know my heart Abba. Please, oh Lord, I am pleading for an intervention into their lives. Please bring back my children into Your Kingdom. Almighty God, these are not the children I raised, trained and encouraged to walk in Your righteousness. Please, hear my humble cry! Lead me to that secret place where I can seek refuge. 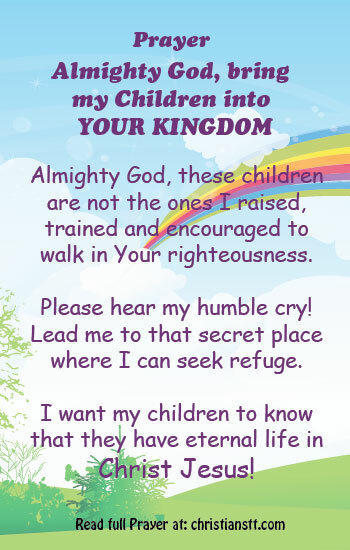 I want my children to know that they have eternal life in Christ Jesus! Holy Spirit, You know all things, guide them and lead them back on the right path. Draw them to You. Jesus! Lord of Lords, King of Kings, the Lamb of God who takes away the sins of the world, my faith is restored to the place where I can find peace as I know without a doubt that all will be well. I will be still because I know You are God. I declare that my children will become new creatures in Christ! In Jesus’ powerful name, SO BE IT… Amen and Amen! Psalm 61:1-2 Hear my cry, O God; attend to my prayer. From the end of the earth I will cry to You, when my heart is overwhelmed; lead me to the rock that is higher than I. Father, I ask and pray that you will bless my children and grandchildren and draw them close to you Lord. Please bring them out of the world and closer to you and help them to find their identity in you Lord and most gracious Father. Send your Holy Spirit to them Lord Almighty to arrest them and convict and convince them of sin of righteousness and judgement and bring them to the cross. Minster to their hearts Lord and let them hear your voice. Open the eyes of their understanding Lord that they may see you. Put a desire in their hearts Lord to want you in their lives because they are lost sinners in need of a Lord and Savior. In Jesus mighty name I pray, In Jesus mighty name I pray amen and so be it. I thank you Lord that their salvation, healing and deliverance is done! In the mighty name of Jesus. Bless you for this prayers..
Sunday is not The Creators set apart day it’s the evil ones, the Sabbath (7th) day is the Creators set apart day from generation to generation forever. Thank you for the prayer bringing my children into your kingdom. We have three boys and our family was perfect then. We all respected each other, going to church Sunday after Sunday. They are all married now and have children and we are losing our grip on them. We have new members of the family which I never raised, their wives. I’m heartbroken. We are now a blended family and the generational gap makes it worst. No matter million things we do, there is always one reason they could point a finger on me that keeps us Apart. I am very much heart broken. I need my family back. Hi Aster, thank you for your comment. I believe we need to keep them in prayer, surrender them and their respective families to God and continue trusting Him to work it all out. It will all be done in His perfect timing. You’re welcome Daphne. Have a wonderful day and weekend! Amen! Thank you my dearest Bevjoy for a prayer of my heart. It’s my everyday prayer that my children never leave His sight. Thank you and God bless you and family always. Amen! God bless you and your family. Thanks!